Congressional investigators are reportedly looking into a meeting between former CIA Director John Brennan and Sen. Harry Reid which took place days before Reid’s letter asking the FBI to investigate alleged Trump campaign ties to Russia was leaked to the media. Brennan, late in the summer of 2016, met with Sen. Harry Reid just days before Reid had told then-FBI Director James Comey that he would be sending him a letter asking the FBI to investigate allegations that President Donald Trump’s campaign had colluded with Russia, investigative journalist Sara Carter reported on Aug. 20. Documents obtained by Congress revealed senior FBI officials were already expecting Reid’s letter even before the senator wrote it, Carter reported, citing congressional sources. Rep. Mark Meadows, North Carolina Republican, said documents obtained by congressional oversight committees raise serious questions about the role of other government agencies in the FBI’s investigation into alleged Trump-Russia collusion. In May 2017, Brennan testified before the House Intelligence Committee that the dossier authored by ex-British spy Christopher Steele was not included in the intelligence community’s assessment of Russia’s meddling in the 2016 election. 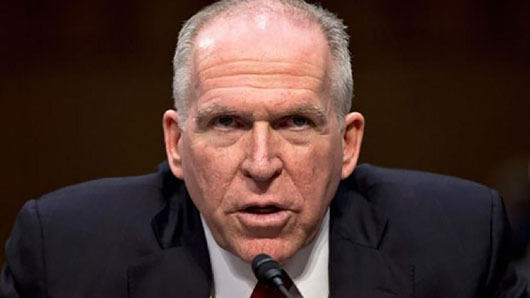 Brennan said the dossier was “not in any way used as the basis for the intelligence community assessment.” He was later contradicted by former NSA Director Mike Rogers and former DNI Director James Clapper. Both officials noted that some parts of the dossier were used in the intelligence assessment. Brennan’s former Deputy Chief of Staff Nick Shapiro, in a recent interview with SaraACarter.com, said Brennan did not know about the contents of the dossier until December 2016.